The Anti Starting Block is designed for the requirements of most normal competition and training pool layouts and combines the highest quality workmanship with the best possible price. 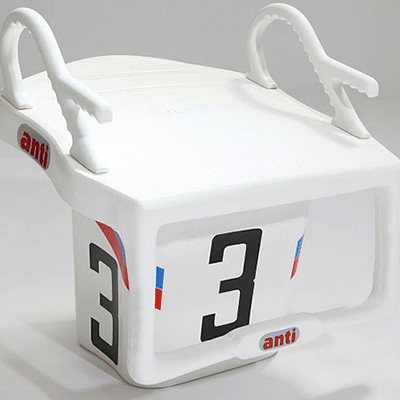 Produced in the UK from the highest quality products and to the highest standards, the Anti Starting Block will provide your pool with years of service and give your swimmers the edge in their training. Provides a high quality and long lasting swimming pool starting block at an affordable price. Base and top block are hand-laid fibreglass, while fittings are SS316. Top surface suitable for sound and timing equipment and available in a range of colours. Can be supplied in pre-numbered sets.